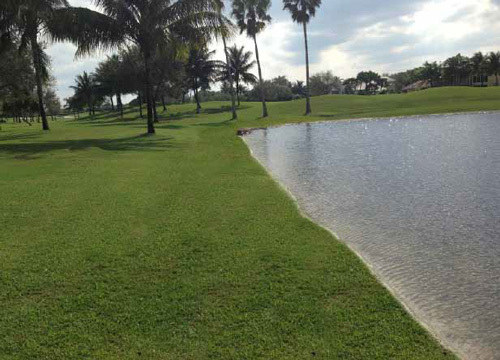 Lakes and ponds are used on golf courses as hazards, for storm water control and as aesthetic features. The shoreline of these lakes and ponds can be difficult to vegetate leaving behind a bare eroded slope. Causes include fluctuating water levels, wind fetch waves, poor soils and burrowing animals. Erosion of the shoreline causes instability of the banks and sediment to fill the lakes resulting in unsightly features on the golf course. 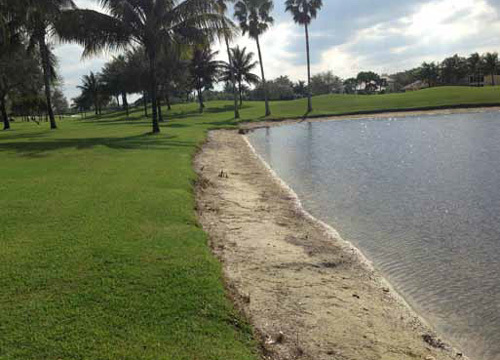 Our HydroTurf™ Revetment System is the solution for this unattractive maintenance problem. HydroTurf™ consists of an impermeable layer overlain by engineering synthetic turf which is infilled with the HydroBinder™ pozzolanic mix. The system resembles turf while delivering an engineered solution. It is an aesthetically pleasing, flexible-concrete revetment which stands up to fluctuating water levels, wind fetch waves, poor soils and burrowing animals. The turf and infill types/colours can be matched to your course in order to blend with the existing turf. 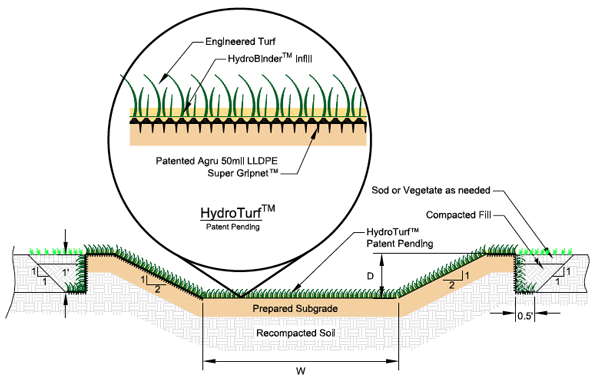 Originally created by Watershed GeoSynthetics LLC, HydroTurf™ is a patented system. 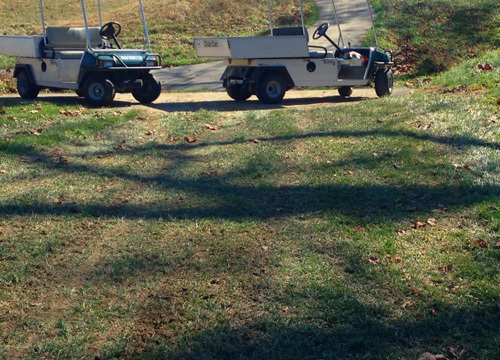 The purpose of golf cart paths is to minimize wear and improve aesthetics. Unfortunately, the vast majority of these cart paths do not achieve these objectives. They all have one or more of several characteristics in common: poor design, construction and location. Soil conditions, inadequate drainage and traffic from golfers and their carts can wreak havoc on the paths and make it impossible to grow healthy turf. The result is worn turf and rutted or bare soil which is unattractive and provides a poor playing surface. Wear from golf carts becomes a costly maintenance item. 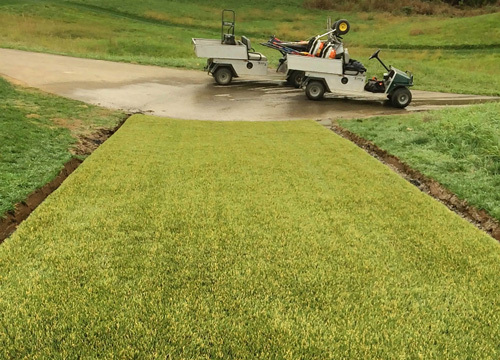 Southwest Greens Cart Path System provides a solution to this maintenance headache. 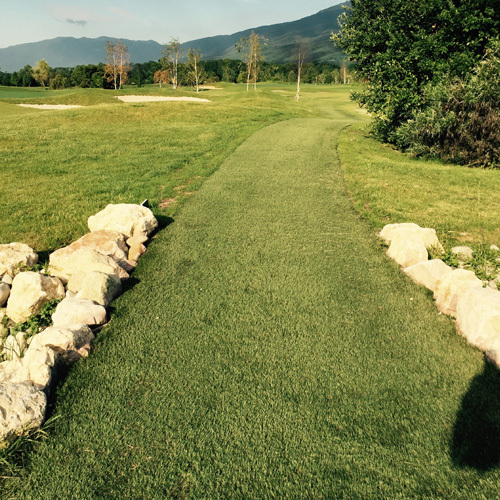 Using our patented engineered synthetic turf system, we deliver an aesthetically pleasing outcome to those areas where worn turf, bare soil and rutting are consistently problematic. 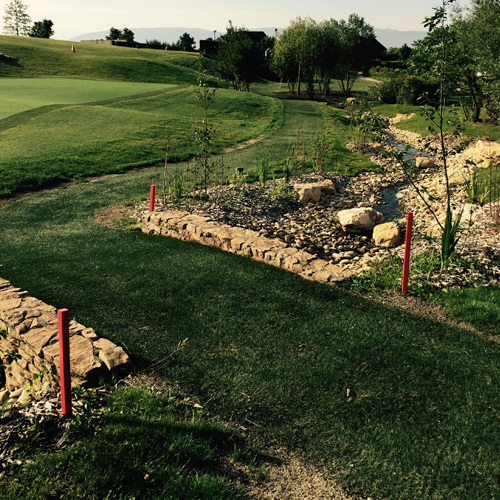 The turf and infill types/colours can be matched to your course in order to blend with the existing turf.